ON DR. C. J. SPEAS' Patchwood Farm near Oak Ridge, Tenn., flower and vegetable seeds are being exposed to radioactive cobalt in an attempt to change their chains of heredity. Plant geneticists estimate that not more than one mutation in many thousands brings an improvement in the progeny. When one does occur, however, it may be greatly superior to its lesser relatives. With the use of powerful manmade radiation, Dr. Speas is kicking hundreds of times as many mutations out of plants as would normally occur in nature. Dr. Speas is not a scientist with the Government laboratories, but an oral surgeon practicing in Oak Ridge. In 1957 the Atomic Energy Commission licensed him to purchase ten curies of cobalt 60. 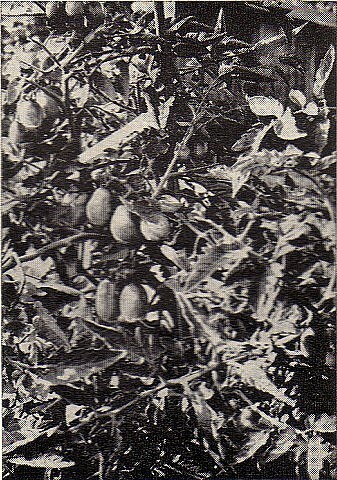 He used it to "atom-blast" seeds for his own experimenting, and has begun offering to the gardening public packets of a few kinds of seeds which he has subjected to radiation exposure of 2,000 to 2,500 Roentgens. Exposing vegetable and flower seeds to cobalt 60 is like firing a load of buckshot into a bag of marbles — the buckshot changes the physical structure of the marbles but passes through the bag. Comparatively speaking, the cobalt affects the seeds in the same way but leaves no harmful after-effects. There is no danger of radiation in handling the seeds. The seeds he uses are the same kinds sold by seed companies. He gives them a germination test to prove that 80 per cent or more are viable before he "blasts" them. If planted and cared for properly, most of the seeds have a good chance of growing, although a few will have been killed by the radiation. No guarantee is made that any of the seeds will produce strange new plants. Two summers ago Dr. Speas planted tomatoes, corn, marigolds and petunias, all of which had been "atom-blasted." Normal tomatoes usually yield five or six slices; some of Dr. Speas' plants yielded from ten to 15 slices, were sausage-shaped, more flavorful and kept better than normal tomatoes. 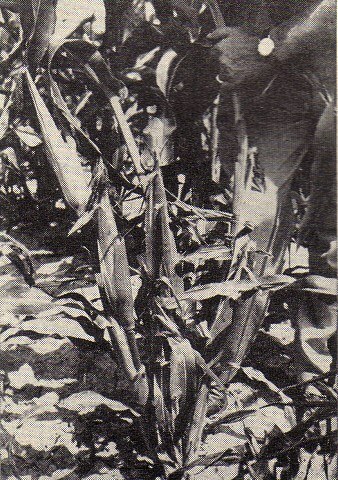 His corn seed produced some plants with eight cars on one stalk; some of it grew closer to the ground and was more resistant than normal corn to windstorms. Some of his petunias germinated two weeks before the normal seeds, were more prolific in growth and more colorful. Perhaps the marigolds produced the most spectacular changes. Several dozen plants refused to grow upright and when they were tied to stakes, they went up the stakes, down the other side and continued to grow vine-like along the ground. The blossoms were huge and in some cases, half yellow and half blue on the same blossom. Several trumpet-shaped marigolds were found. These turned over at the top of the blossom and were single instead of double. When the seed heads were dried, they produced twice as many seeds as normal marigolds. Dr. Speas hopes that amateur gardeners will help speed up the thousands of experiments needed to produce true strains of improved plants which may possibly result from radiation-induced mutations. Who knows — perhaps someone will grow the pure white marigold for which the W. Atlee Burpee Company has a standing offer of $10,000 to the first to do it. The "atom-blasted" seeds are intended frankly for experimenting by amateurs who want to see what strange or unexpected plants they may produce. It is in the second generation that the widest changes are most likely to occur. Seeds from the first "atom-blasted" crop should be saved, therefore, and planted the next year in order to fully appreciate the number of mutations the radiation has produced. Corn has grown dwarf, many-branched, with eight ears to the plant. Tomatoes have grown into sausage shapes. 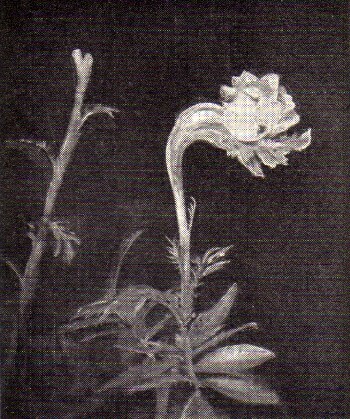 Marigolds have produced trumpet shapes.